George Habash (Arabic: جورج حبش‎‎), also known by his laqab "al-Hakim" (Arabic: الحكيم‎‎, "the wise one" or "the doctor"; 2 August 1926 – 26 January 2008) was a Palestinian Christian politician who founded the left-wing secular nationalist Popular Front for the Liberation of Palestine (PFLP). Habash served as Secretary-General of the Palestine Front until 2000, when ill health forced him to resign. 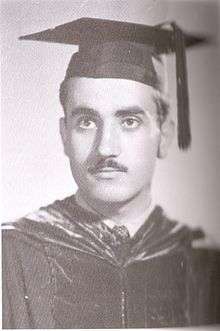 George Habash as a doctorate in medicine from the American University of Beirut, 1951. Habash was born in Lydda (today's Lod) to an Eastern Orthodox Palestinian family in 1926. As a child, he sang in the church choir. Habash, a medical student at the American University of Beirut, was visiting his family during the 1948 Arab-Israeli war. In July 1948, the Israeli Defence Force captured Lydda from Jordanian and Arab Liberation Army forces, expelling all of the town's Arab residents and killing Habash's sister. Habash and his remaining family became refugees and were not allowed to return home. Political thinkers who were influences on Habash at this period included Constantin Zureiq, whose lectures at AUB on 'Arab nationalism and the Zionist danger' in the late 1940s and early 1950s Habash had attended, and Sati' al-Husri an Arab Muslim intellectual who emphasized national cohesiveness, territorial patriotism, and loyalty to the state, and gave priority to Arab unity over Islamic unity. In 1951, after graduating first in his class from medical school, Habash worked in refugee camps in Jordan, and ran a clinic with Wadie Haddad in Amman. He firmly believed that the state of Israel should be ended by all possible means, including political violence. In an effort to recruit the Arab world to this cause, Habash founded the Arab Nationalist Movement (ANM) in 1951 and aligned the organization with Gamal Abdel Nasser's Arab nationalist ideology. He was implicated in the 1957 coup attempt in Jordan, which had originated among Palestinian members of the National Guard. Habash was convicted in absentia, after having gone underground when King Hussein proclaimed martial law and banned all political parties. In 1958 he fled to Syria (then part of the United Arab Republic), but was forced to return to Beirut in 1961 by the tumultuous break-up of the UAR. Habash was a leading member of the Palestine Liberation Organization until 1967 when he was sidelined by Fatah leader Yasser Arafat. In response, Habash founded the Popular Front for the Liberation of Palestine. In 1964 he began reorganizing the ANM, regrouping the Palestinian members of the organization into a "regional command." After the Six-Day War in 1967, disillusion with Nasser became widespread. This prompted the foundation, led by Habash, of the Popular Front for the Liberation of Palestine (PFLP) as a front of several Palestinian factions, like the "heroes of return" and "Palestinian Liberation Front", along with the ANM on 11 December, when he also became its first Secretary-General. Habash was briefly imprisoned in Syria in 1968, but escaped. In the same year, he also came into conflict with long-time ally Wadie Haddad, but both remained in the PFLP. At a 1969 congress the PFLP re-designated itself a Marxist–Leninist movement, and has remained a Communist organization ever since. Its pan-Arab leanings have been diminished since the ANM days, but popular support for a united Arab front has remained, especially in regard to Israeli and western political pressures. It holds a firm position regarding Israel, demanding its complete eradication as a racist state through military struggle and promotes a one-state solution (one secular, democratic, non-denominational state). The 1969 congress also saw an ultra-leftist faction under Nayef Hawatmeh and Yasser Abd Rabbo split off as the Popular Democratic Front for the Liberation of Palestine (PDFLP), later to become the Democratic Front for the Liberation of Palestine (DFLP). During Habash's time as Secretary-General, the PFLP became known as one of the most radical and militant Palestinian factions, and gained world notoriety after a string of aircraft hijackings and attacks against Israel affiliated companies as well as Israeli ambassadors in Europe mostly planned by Haddad. The PFLP's pioneering of modern international terror operations brought the group, and the Palestinian issue, onto newspaper front pages worldwide, but it also provoked intense criticism from other parts of the Palestine Liberation Organization. In 1970, Habash was evicted from Jordan due to the key role of the Popular Front in the Black September clashes. In 1974, the Palestinian National Council adopted a resolution recognizing a two-state solution to the Israeli–Palestinian conflict and Habash, who opposed this, formed the Rejectionist Front from several other opposition parties. Habash aligned the PFLP with the PLO and the Lebanese National Movement, but stayed neutral during the Lebanese Civil War in the late 1970s. After a stroke in 1980, when he was living in Damascus, his health declined and other PFLP members rose to the top. After the Oslo Agreements, Habash formed another opposition alliance of Rejectionists. Islamist organizations such as Hamas and the Islamic Jihad Movement in Palestine, that became prominent during the First Intifada. In 2000, he resigned from his leadership post of the PFLP due to poor health and was succeeded by Abu Ali Mustafa. He continued to be an activist for the group until 2008, when he died of a heart attack in Amman. The PFLP ignored tensions with the mainstream leadership of Yasser Arafat's Fatah faction, and instead focused on bringing about revolutionary change in Jordan. Habash expressed the opinion that what proceeded was not "only military but also psychological warfare" and one had to "hold the Israelis under permanent pressure". In 1970, Habash masterminded the hijackings of four Western airliners over the United States, Europe, the Far East and the Persian Gulf. The aircraft were blown up, after the passengers and crews were forced to disembark. The Dawson's Field hijackings of 1970 were instrumental in provoking the Black September crackdown, which came close to destroying the PLO. The hijackings led King Hussein of Jordan to carry out a major offensive against militant strongholds in his kingdom resulting in the deaths of thousands of Palestinians. In autumn 1970, Habash visited Beijing. After Black September, the PLO fedayeen relocated to Lebanon. In 1972, Habash experienced failing health, and gradually began to lose influence within the organization. The Palestinian National Council's (PNC) adoption of a resolution viewed by the PFLP as a two-state solution in 1974, prompted Habash to lead his organization out of active participation in the PLO and to join the Iraqi-backed Rejectionist Front. Only in 1977 would the PFLP opt to rejoin, as the Palestinian factions rallied their forces in opposition to Anwar Sadat's overtures towards Israel, pro-U.S. policies and fragmentation of the Arab world. During the Lebanese Civil War that broke out in 1975, PFLP forces were decimated in battle against Syria Later, the PFLP would draw close to Syria, as Syria's government shifted, but PFLP involvement in the Lebanese war remained strong until the U.S.-negotiated evacuation of PLO units from Beirut in 1982, and continued on a smaller scale after that. After the signing of the Oslo Peace Accords in 1993, Habash and the PFLP again broke completely with Arafat, accusing him of selling out the Palestinian revolution. The group set up an anti-Arafat and anti-Oslo alliance in Damascus, for the first time joined by such non-PLO Islamist groups such as Hamas and the Palestinian Islamic Jihad, which had grown to prominence during the First Intifada. After finding the position sterile, with Palestinian political dynamics playing out on the West Bank and Gaza areas of the Palestinian National Authority (PNA), Habash carefully sought to repair ties to Arafat, and gain a hold in post-Oslo politics without compromising PFLP principles. However, there is no indication that he ever accepted the two-state solution. Asked once what he would do if he could return to his family home in Lydda, he replied that he would not evict the Jewish residents, but build a further floor to accommodate them.. This balancing act could not save the PFLP from being eclipsed by the militant Islamist factions on the one hand, and the resource-rich Fatah with its PNA patronage network on the other. The significance of the PFLP in Palestinian politics has diminished considerably since the mid-90s. The PFLP participated in the Palestinian legislative elections of 2006 as Abu Ali Mustafa won 4.2% of the popular vote. In the late 1990s, Habash's medical condition worsened. In 2000 he resigned from the post as Secretary-General, citing health reasons. He was succeeded as head of the PFLP by Abu Ali Mustafa who was assassinated by Israel during the Second Intifada. Habash went on to set up a PFLP-affiliated research center, but he remained active in the PFLP's internal politics. Until his death he was still popular among many Palestinians, who appreciate his revolutionary ideology, his determination and principles, the rejection of the Oslo Agreements and his intellectual style. Habash died on 26 January 2008, at the age of 82 of a heart attack in the Jordan Hospital, Amman where Habash was a cancer patient. The President of the Palestinian National Authority, Mahmoud Abbas called for three days of national mourning. Habash was buried in a suburban cemetery of Amman with processions by the Eastern Orthodox Church. Abbas said Habash was a "historic leader" and called for Palestinian flags to be flown half-mast. Abdel Raheem Mallouh, PFLP deputy Secretary-General, called Habash a "distinguished leader... who struggled for more than 60 years without a stop for the rights and the interests of his people". Hamas leader and dismissed Palestinian Prime Minister Ismail Haniyeh sent his condolences, saying Habash "spent his life defending Palestine". ↑ Bernard Reich (1990). Political leaders of the contemporary Middle East and North Africa: a biographical dictionary. Greenwood Publishing Group. p. 528. ISBN 978-0-313-26213-5. ↑ Macleod, Scott (28 January 2008). "Terrorism's Christian Godfather". TIME. 1 2 3 "Palestinian radical founder dies". BBC. 26 January 2008. ↑ Cnaan Liphshiz (27 January 2008). "Tales of Black September". Haaretz. ↑ Paula Schmitt,'Interview with Leila Khaled: 'BDS is effective, but it doesn't liberate land',' +972 magazine 17 May 2014. ↑ Edmund L. Andrews; John Kifner (27 January 2008). "George Habash, 82, founder of Popular Front for the Liberation of Palestine". The New York Times. 1 2 "PFLP founder George Habash dies". Al Jazeera. 28 January 2008.